When it's too hot, keep a cool head. When it's too cold, keep a warm heart." Ajahn Brahm talks about changing our attitude to who we think we are and finding peace with our imperfection. Are all difficult and challenging circumstances in life a result of bad karma? Or is it more a matter of having a negative perception of the circumstances? Bhikkhuni Hasapanna points to the difference between what is really karma, and the huge role that perception plays in shaping our reactions to circumstances. Bhante Sujato reflects upon contemporary movements within Buddhism and society more broadly to remove discrimination and create a fairer and more equal world. Contrary to our expectations, life is happier when we let go of control. So let go of your inner control freak and relax as Ajahn Brahm explains how our lives are out of control - and that's not such a bad thing after all. Ajahn Brahm discusses ways to deal with addictions. 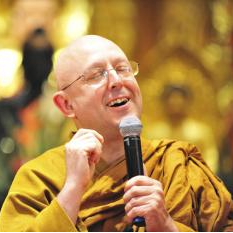 Ajahn Appichato discusses how to use speech skilfully, carefully and for the benefit of all. Ajahn Brahm discusses how to deal with the fault finding mind and replace it with the mind that sees beauty.